My kiddos had a blast camping this week and I was so excited that I got some projects done (although I can't share them yet)! I had some fun cards scheduled to post while we were camping this week but for some reason they never posted and they are gone, like they just disappeared! Is anyone else having problems with blogger? I'll repost them this week when I get a chance! For now I am sharing some pics of the kiddos! I'm so thankful they got to spend this fun week with their Mammy (my mom). It was a wonderful way to spend Mother's Day! Mammy made sure to get a site next to the playground which was so nice! Baby E riding her bike! Oldest E and Baby E making a fairy house (we have a lot of these around our house too)! My monkey's not happy just playing in the train, they have to be on top of it! Lot's of pics of Baby E because it was her first camping trip where she could actually enjoy the fun! Another of Baby E! She had so much fun and was all smiles! 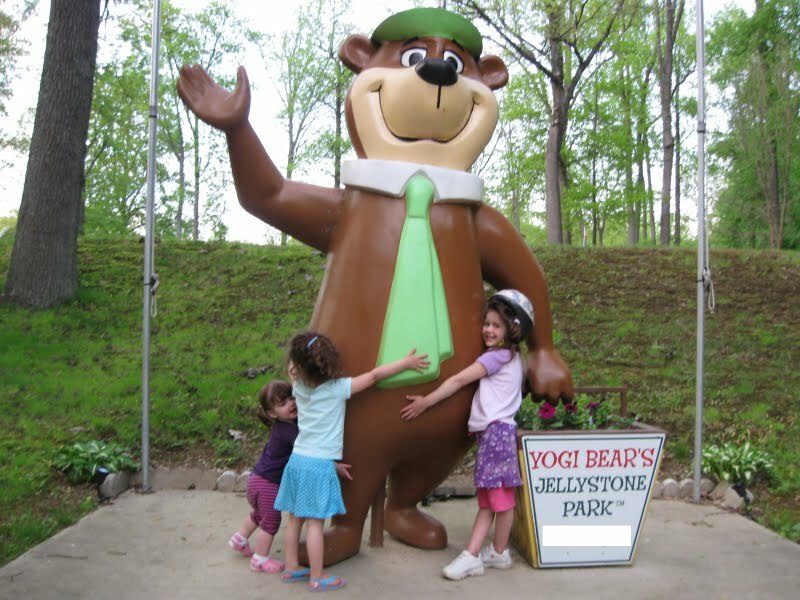 My 3 Es giving Yogi a hug! 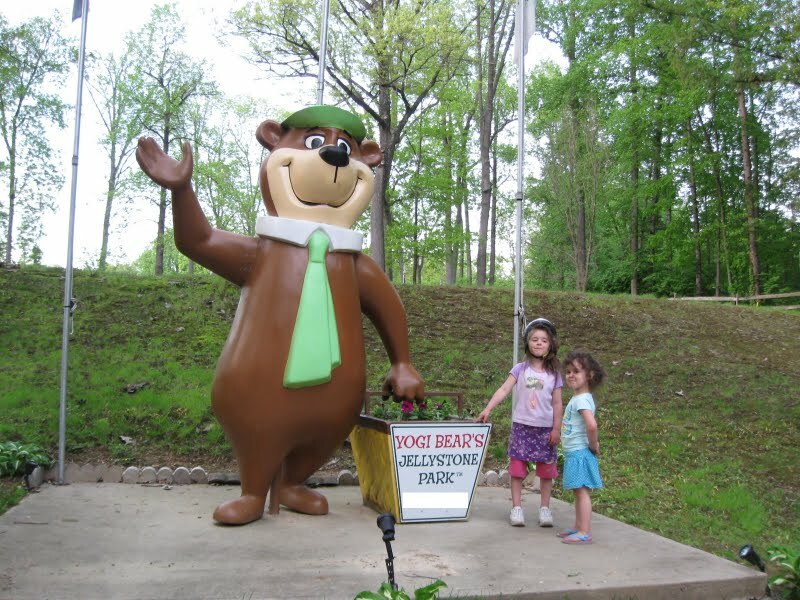 Oldest E and Middle E were yelling at Yogi for stealing the picnic basket! Middle E yelled at the Yogi Bear that rode on the hayride with them too..hehe! Crazy about Cricut Thankful Thursday current challenge is a Mother's Day project made with a loved one! You are playing for a chance to be entered into the monthly drawing for a Post-it Prize pack and you still have 5 days to enter! My Craft Spot Monday Challenge this week is to Bling It Up! I know everyone has some bling just waiting to get used!! You are playing for a chance to win the Sweet Sentiments Set #1 stamp set (my fav) and you still have one day to play! Birthday Sundaes challenge this week is a recipe challenge! You must use 3 embellishments and 2 pattern papers on your Birthday Card! Playing for fun this week and you still have tomorrow to enter. If you don't get the chance to whip something up, make sure you stop by Sunday for our new and exciting challenge! Celebrate the Occasion has a challenge perfect for the season. The challenge is to make a Wedding project using a ribbon somewhere on your project! You are playing for a chance to be entered into the monthly drawing for the Spring Holiday Cards Cricut Cartridge! You have until Sunday to Celebrate the Season with us! 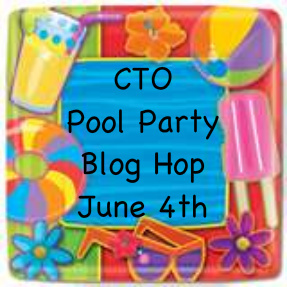 We are also going to be having a fun Blog Hop at CTO on June 4th! I do hope you'll join us! Thanks for stopping by and I'll be back to posting fun projects soon! Have a great weekend! Looks like a great time!! I missed you this week- glad to have you back!